Autumn is traditionally the hottest season in the games industry, so does esports. Let's look the statistics of the last autumn month of this year. 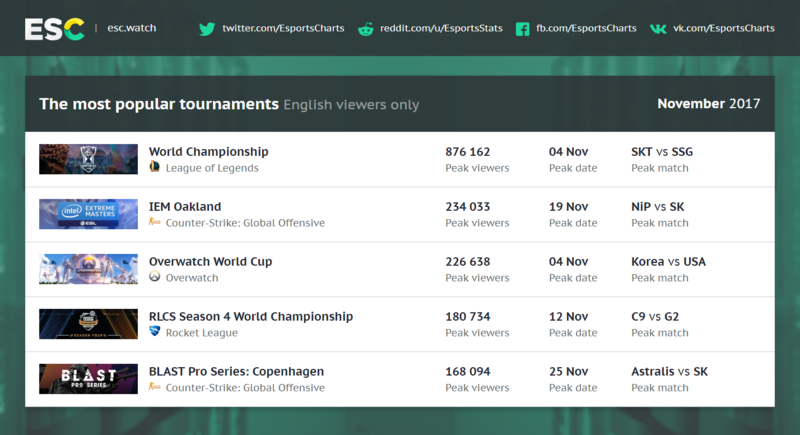 Finals of The World Championship 2017 took its rightful place in the list of the most popular broadcasts of November. It took place in the Chinese capital Beijing in a huge stadium with a capacity of 91 thousand people. It was a traditional confrontation between two Korean teams SK Telecom T1 and Samsung Galaxy. If at least one Chinese team reached the finals, the number of spectators would increase significantly. In reality, the finals was watched by fewer people than the semi-finals. Even so, the results are breathtaking. The mobile game King of Glory took the second place — King Pro League Fall Season. As we can see, this game appears in our blogs with enviable regularity. If we llok at the quarterly achievements of Nintendo in mobile games market with phenomenal success of King Glory and Hearthstone we will clearly understand the immense potential in mobile esports. The new Valve tournament system brings a phenomenal number of Dota 2 tournaments. 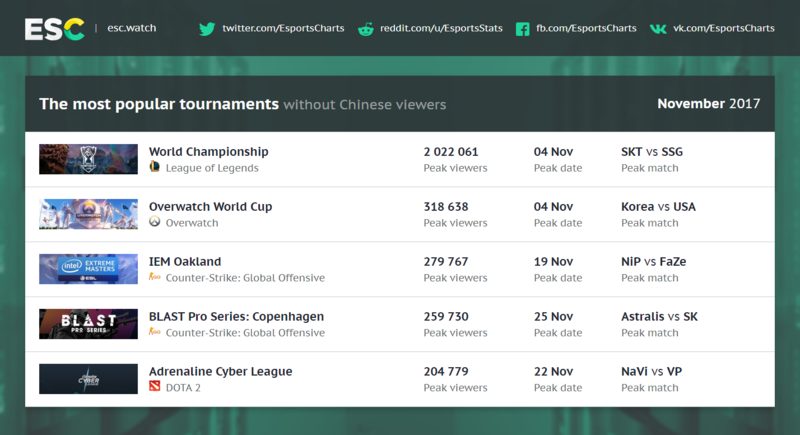 A small amount of League of Legends tournaments and good results of Chinese teams transformed into impressive viewers statistics in November. Overwatch from Blizzard is also very popular in China. Overwatch World Cup has gathered quite impressive audience, although Blizzard, most likely, counted on more. The situation changes a lot without the Chinese viewers, but not dramatically. The World Championship 2017 comes first, but behind it the Overwatch World Cup. There were only a few major esports events last month. 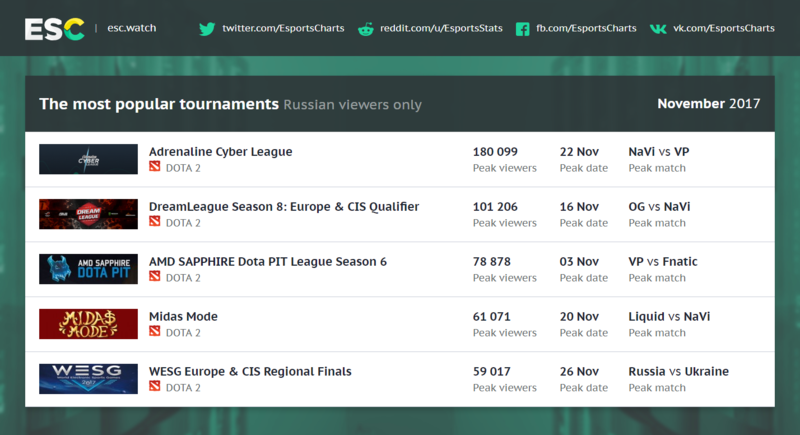 Adrenaline Cyber League rose so high because of the huge Russian-speaking audience. Statistics of the English-speaking top is not very different from the general, but it has an untraditional nominee — Rocket League. RLCS Season 4 World Championship gathered a solid audience of viewers. As we can see, Rocket League has the possibility to break into the highest echelon of cybersport disciplines. The CIS region is the most unique. For local fans exist only Dota 2. The new tournament policy provides a huge number of championships and competitions every month. Many talked about the potential overextension of the esports ecosystem, but we will have a chance to summarize everything only in the end of season in Spring. 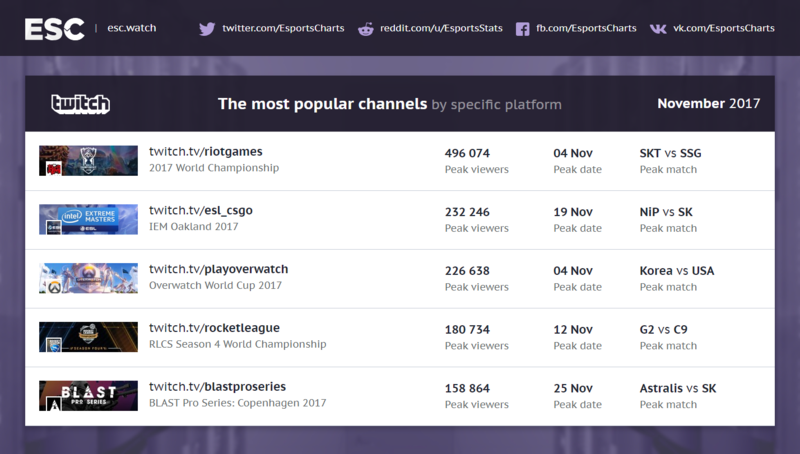 The most popular in the world online broadcasts platform - Twitch, continues to be in the mainstream. 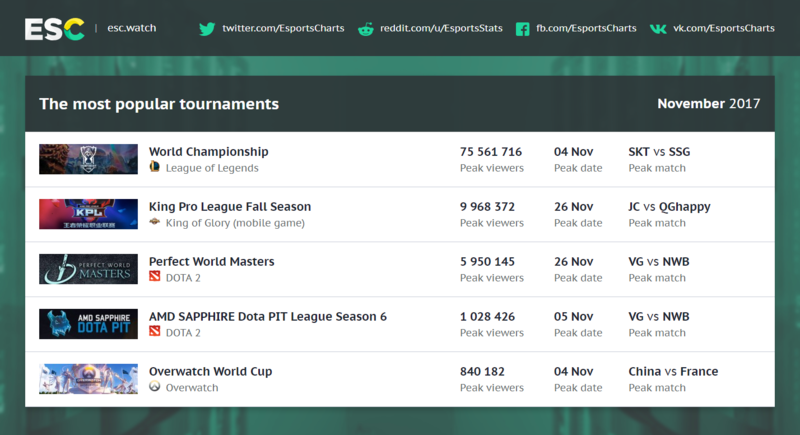 The largest esports events mostly are looked on Twitch. However Youtube Gaming is more popular to watch Worlds 2017 — primarily because of the huge audience from South America.